Pile it on, Make it your OWN.. Everything is Delish from Breakfast to Dinner! First timer!! 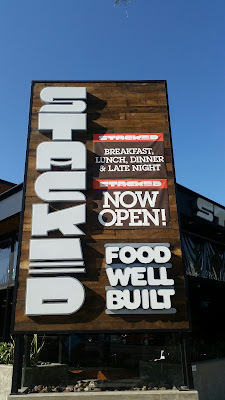 Yes it was my first time visiting Stacked but it will not be the last time. Their sign says it all! FOOD WELL BUILT. How can it not be when you are building it with their freshest, most flavorful and tasty ingredients!? I was early enough for breakfast and I am so glad that I was. They have signature cocktails for all times of the day. 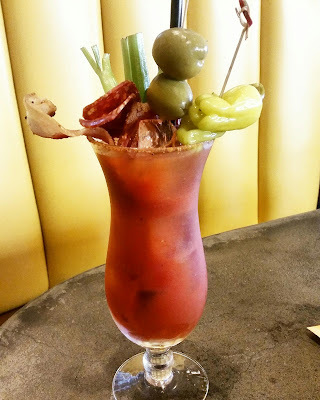 I have not had a Bloody Mary in years and I fell in love all over again with the sharp crisp taste of the Bloody Mary at Stacked. As you can see, you can top it off with and fill it up with almost anything! You can make it mild or spicy, add shrimp, bacon and have the rim salted. Yes please! There is more where that beautiful drink comes from. The bar staff is full trained in the art of specialty drinks. 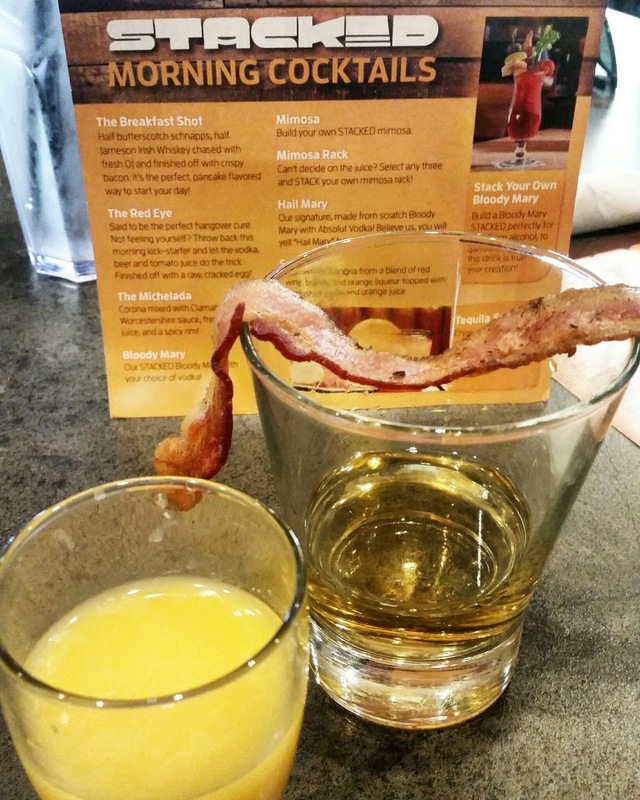 The Breakfast Shot is one in it's own! I can not even begin to tell you how much I liked it and how I would love to have another.. any time of the day. With the Candied Bacon that Stacked is so well known for, the drink completes itself in your mouth and down to your belly. It is really yummy and pairs well with the ingredients that make it so good.. the alcohol and bacon hehe. Tony the manager was super friendly at the location in Huntington. He was very helpful on the selection of featured items to try and drink. He suggested I try the Blueberry Fritters, I did and I totally loved them! 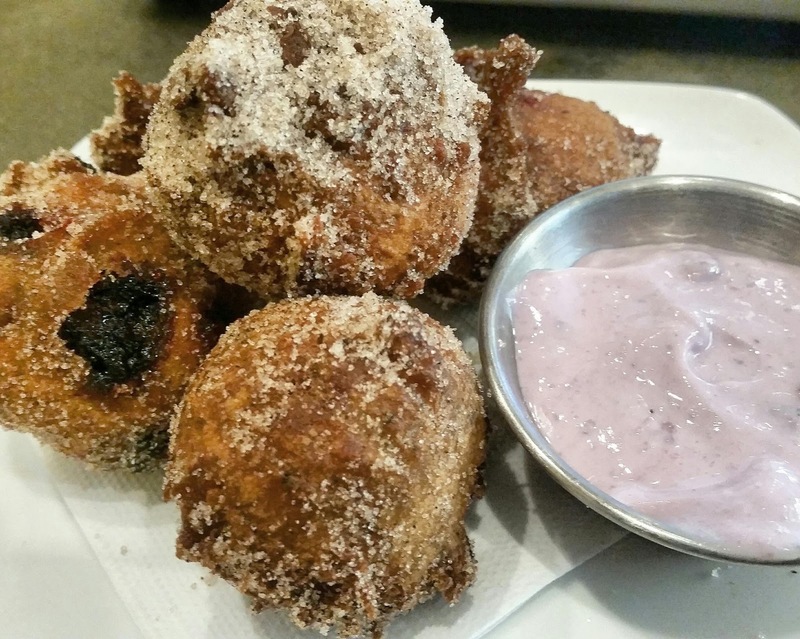 The blueberry yogurt these little goodies are served with is a mouth watering perfect match to the warm sugar melting with the fritter. 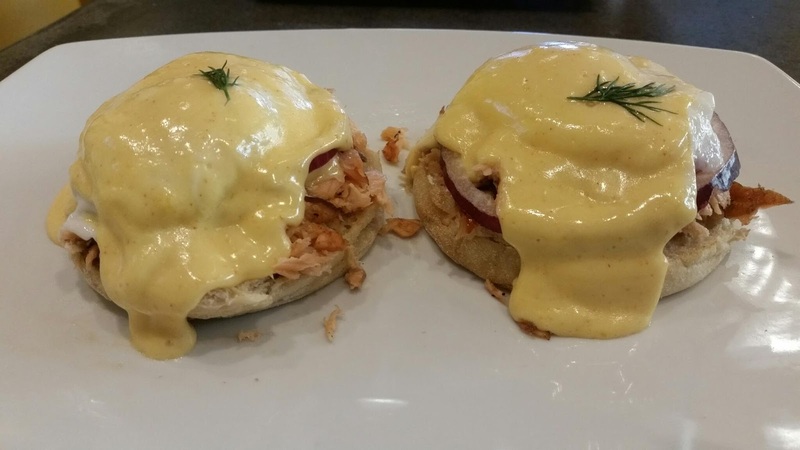 Hot Tip... a tasty treat that fills both the breakfast and brunch craving... the extremely tasty Honey Smoked Salmon Benedict is perfect. The egg, red onion and spot on smoked salmon are an explosion of oh my gosh in your mouth! So thanks to the tasty drinks and the very chill atmosphere I may have stayed a bit longer than breakfast! How could I not?! 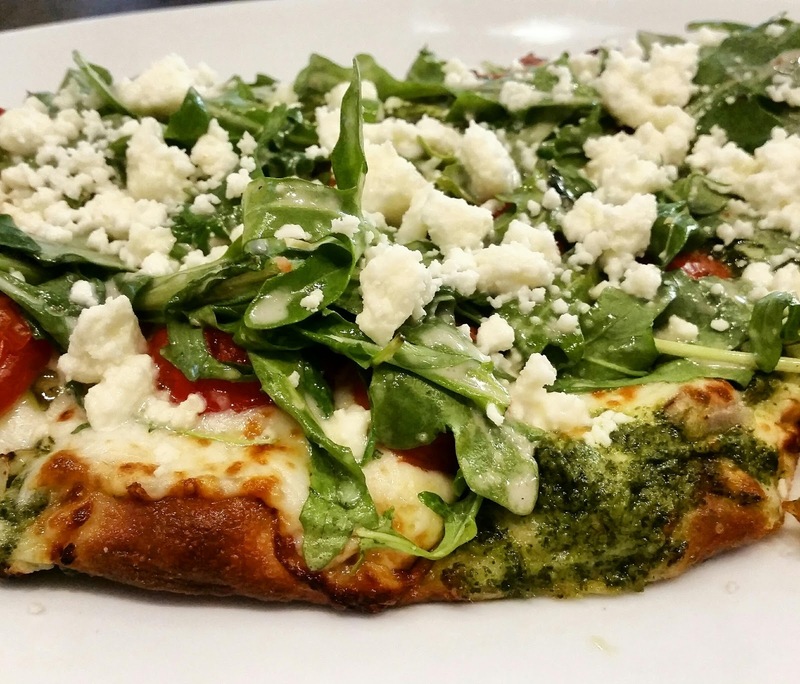 The New Basil Pesto Arugula Pizza is amazing. It is crisp like a flat bread and packed with flavor that you want to continue eating.. until it's gone... Sorry not sorry! 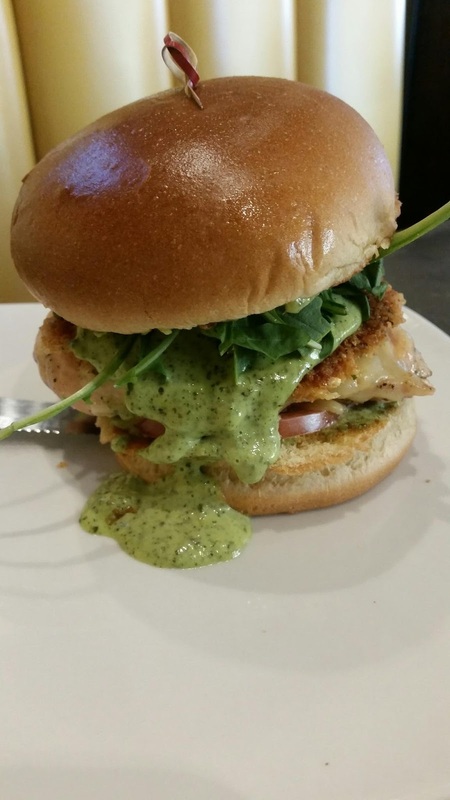 But that is NOT all, I was totally eye balling the new Spring Pesto Chicken Sandwich. Seriously delish. I LOVE pesto, but this is over the top good. Another HOT TIP - Thanks Tony.... he suggested that I ask for double the crispy cheese, once again, I did and it was a great tip and yum in my belly! I had such a tasty time at Stacked but how can you not get a Thin Mint Shake?! RIGHT?! I was so full, I had to get it to go... and they made it just right. Everything is so easy to customize you can get out of hand but it is just so good. * Traditional Service is first and foremost but the love of technology has come into play with easy table IPad ordering. * Over 170 ingredients to play around with and stack up on your favorite dish! * There is a completely separate area for any and all gluten free food prep! That is going the extra mile!! 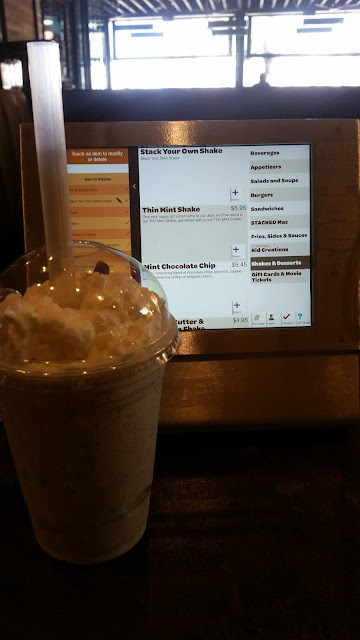 * The location in Huntington has a sweet deal going on - Movie tickets to Bella Terra Cinemark Movie Theater are only $8.95 with any purchase at Stacked. Get a drink and grab a movie! * You really are getting what you are ordering at a price point that is awesome for the customization of your meal! * The Chef's are coming up with the menu fully developing the taste and they are pretty good at it! The Executive Chefs Javier and Martin are top notch. I am really looking forward to trying out Stacked for dinner and drinks. I love that they off the movie special at the closest Stacked to me in Huntington! Have you been to Stacked? 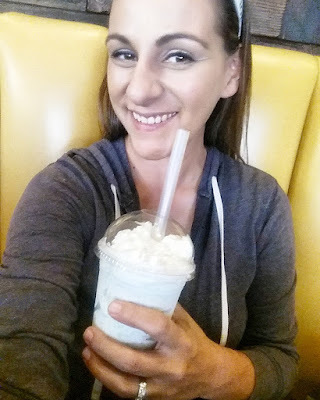 What is your favorite drink or dish? How do you STACK it?